This is a scene of a Flemish village around a river. It is from an original by Flemish artist Demets in 1958, and shows the village St. Eloois Vijve. A master of composition and technique, Demets has created a scene that makes excellent use of color and the textures in nature. The autumnal hues are captured beautifully as is the feeling of the variety of textures that nature has to offer in this scene. As a landscape tapestry, this work "Riverside" shows us the feeling of what it's like to live along a river in countryside Europe. 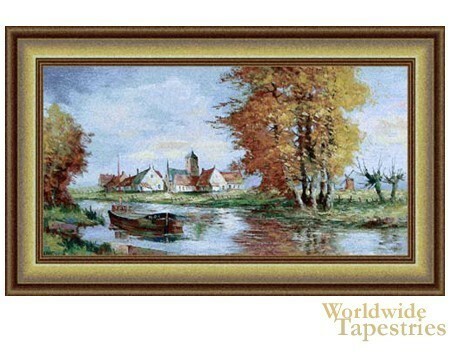 This tapestry "Riverside" is backed with a lining and has a tunnel for easy hanging. Dimensions: W 64" x H 38"